Keeping clutter at bay is the fastest way to make a small room feel bigger and add value to your home. So, this is why good storage is crucial to making the very best of the – even limited – space you have available. Here are ten top tips for doing just that. Stylish and smart, this Umbra Sling Shoe Storage Rack is a great way to keep shoes tidy in a hallway or elsewhere in the home. Priced £30 at Hurn & Hurn. 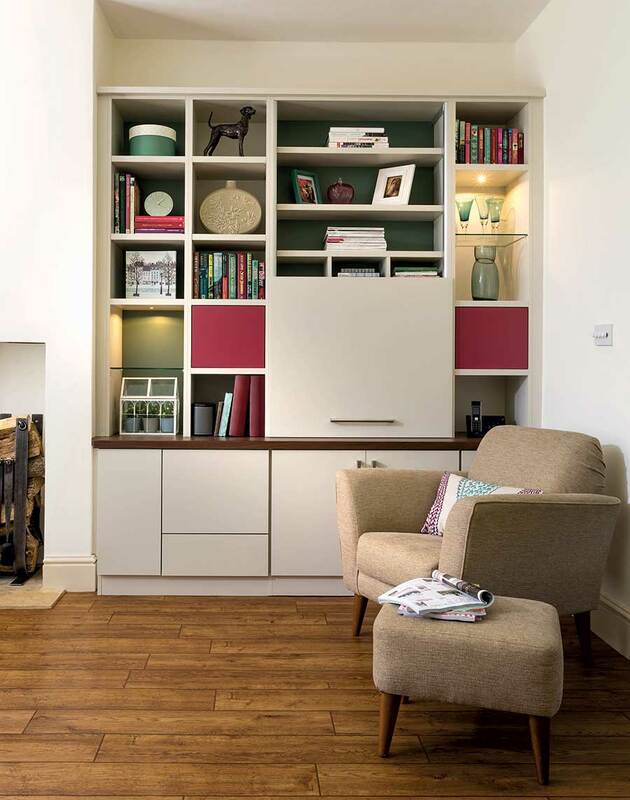 Fitted furniture or shelving has one big advantage over freestanding pieces – it can be built to fit the space available. This is great if you have an alcove that’s particularly narrow but you’d still like to make use of, for example. Equally, if you want to build storage into an area with a sloping ceiling or uneven walls, fitted storage can be designed and made to work around those imperfections and ensure no space is wasted. If the area is particularly awkward, consider bespoke furniture, which can be pricier though worth it for a flawless finish. Alternatively, a local carpenter is a cost-effective way to go, as they will be able to build storage exactly to suit your small space. Fitted furniture from Neville Johnson makes the best use of the alcove in this living room. Prices start from £3600. 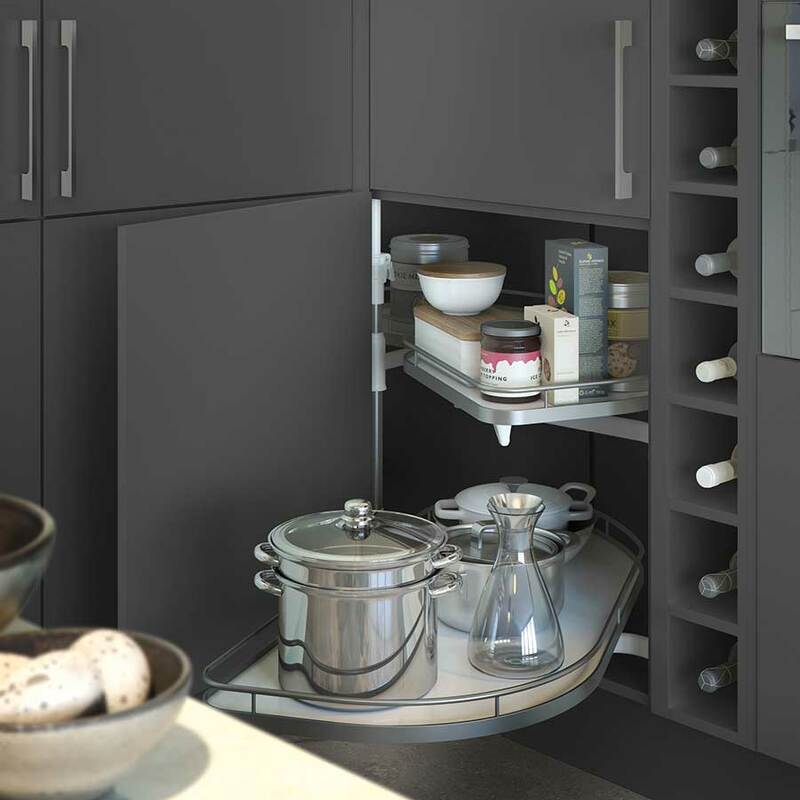 There are a whole host of clever internal storage solutions designed to help you make the most of a small kitchen. Once only found in top-end kitchens, they are now available across the price points. 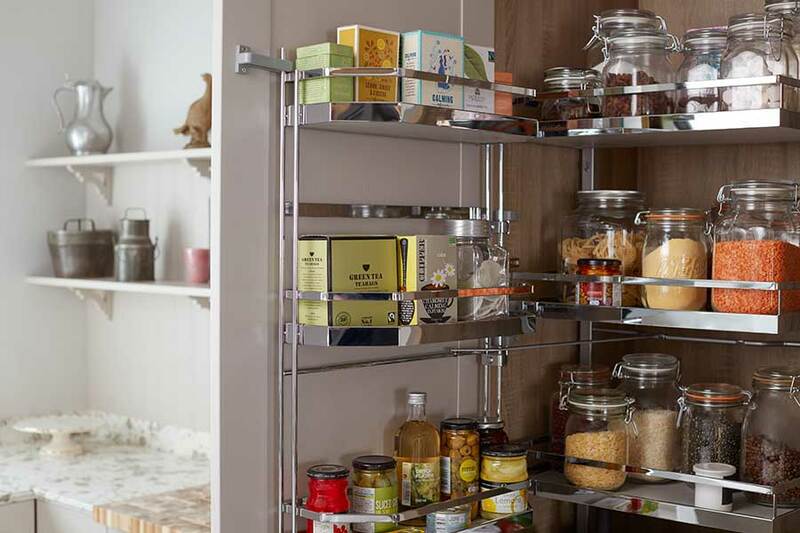 For example, turn a narrow cupboard into a floor-to-ceiling larder, with racks that pull out fully and are accessible from the both sides for complete convenience. And for corner units, ensure you don’t lose anything at the back with kidney-shaped shelves that pull out into the room so all contents are visible. Invest in quality systems that are designed to hold greater weights and you’ll have the flexibility to store even heavy and bulky items; from tins and bottles to pans and casserole dishes, even pet food or cleaning products. The less space you have, the smarter you have to be with it. Here are a few more simple ideas. The High Line Le Mans corner unit from Optiplan Kitchens pulls out to ensure nothing is lost at the back, priced £625. In a small bathroom, keeping the floor clear will not only create an illusion of space, it will also make the room easier to clean. A wall-hung vanity unit will achieve this and give you a purpose-built area for storing toiletries. Look out for furniture with a drawer that pulls out fully so you can see everything at a glance and with compartments that keep it in good order. This arrangement also means you can have a stylish countertop basin on the top with a wall-mounted tap – there’s no reason why a small bathroom can’t still have on-trend good looks. Adopt more tried-and-trusted tricks-of-the-trade to create the illusion of more square inches in your small bathroom. 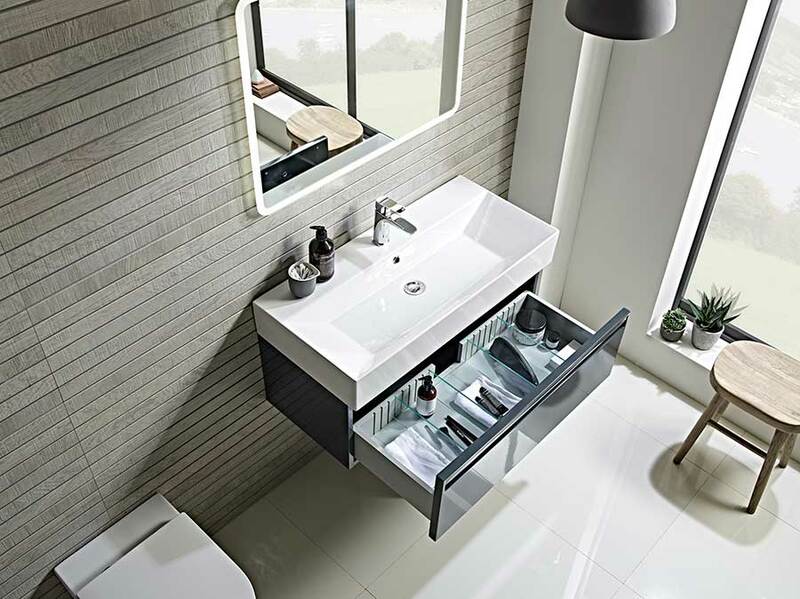 From Pure Bathroom Collection’s Tavistock range, the Forum 900 wall-mounted vanity unit features a spacious compartmentalised drawer to house all bathroom essentials. Shown in dark grey, priced £797. By necessity, the bed is the piece that takes up the most space in a small bedroom. Choosing a model with incorporated storage makes sense, particularly for storing bulky items such as bed linen, blankets or towels. A divan bed with drawers built into the base is a great solution – just make sure you choose a base and mattress that are designed to work together to ensure comfort. 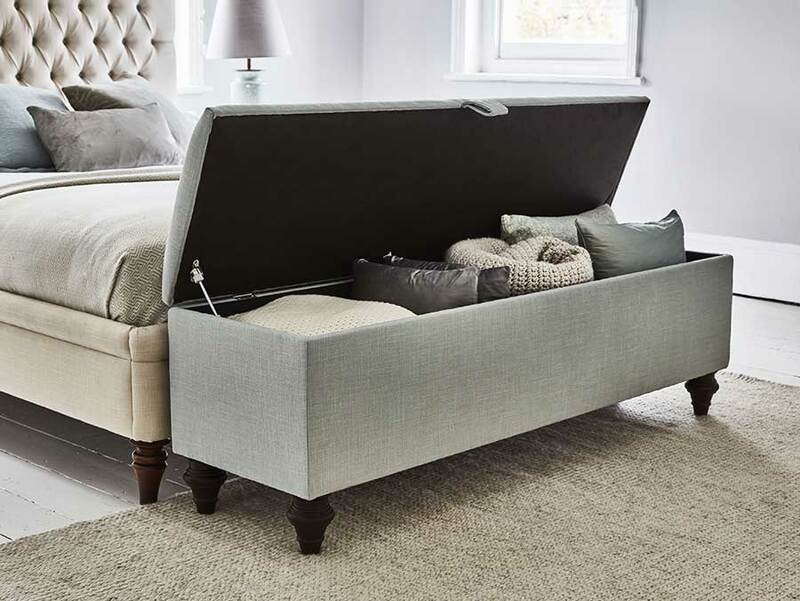 If you really want to capitalise on the area under the mattress, consider an ottoman bed with a mechanism that lifts up the mattress to reveal all a storage space as large as the bed. Enjoy a better night’s sleep with our bed buying guide. The Willow king size ottoman bed from Button & Sprung has masses of storage underneath. It is shown here in Candy and priced £1375. Modern homes are getting smaller – particularly for people who live in the middle of towns or cities – and manufacturers are responding to this. Look out for ranges of furniture and products that are specifically designed for smaller spaces. For example, bathroom storage that is built into the corner or shelving units that also include a pull-out section that can used as a desk. If your main living area also serves as kitchen, dining area and study, open shelving that provides plenty of storage for all these functions but without overwhelming the space is an effective choice. Containing storage space, integrated power supply and a light, the Flatmate desk from Furl folds to the wall and a depth of just 12mm when not in use. Priced £880. With a small space, the key is to make the most of every available inch – particularly if you can utilise otherwise wasted space. In the kitchen, put shallow drawers in the empty plinths of the base units and you can use them to store flat items like baking trays. Also, build wall units all the way up to the ceiling rather than leaving an unusable gap on top that just gathers dust. In an area of shallow wall space alongside a window or door, install reduced-depth shelving that is still ideal for storing glasses, mugs and storage jars in a single row. Try to avoid building up to the ceiling on all sides, however, as it can make it feel like the walls are closing in. Leave some area of wall visible to help the space breathe a little. The Kesseböhmer 600mm Tandem larder unit makes use of the space on the inside of the door as well as inside the cupboard. Shown in a kitchen from Alchemy, prices start from £10,000. If you choose wall-hung storage in the bathroom, it’s likely that you’ll need a false wall built to hide the framework from which the furniture is suspended. This might sound a poor choice in an already small room, but you can create alcoves between the false and real wall for useful open storage. 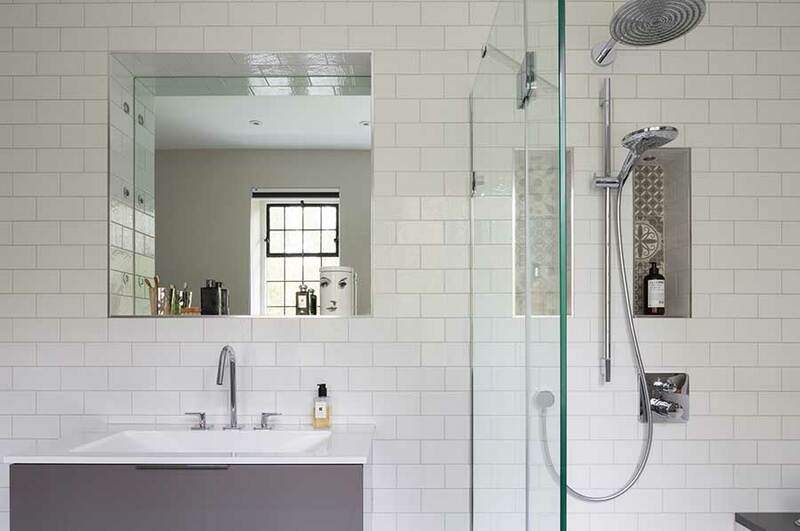 Perfect for in the shower for shampoo bottles (you can also use the false wall to hide the pipework for the shower or taps) or above the basin for soap, tile the alcoves and install lighting to create a feature. Another way to use an alcove above the basin is to create a cabinet by placing a hinged mirror over the top. As it is flush to the wall, it won’t intrude on the room – useful in a small space –nor will you ever bang your head on it! Recesses in the shower and above the basin offer spaces for toiletries and an inset mirror in this family bathroom from Ripples. In a compact bedroom, every item needs to earn its place. Therefore, choose pieces that will serve more than one function. For example, a blanket box will not only hold bulky items but it can also double as a seat, or place your chest of drawers next to the bed and it can serve as a bedside table. And it might seem like an indulgence to have a dressing table in a small space, but if it doubles as a desk then you can use the storage compartments to hold both make-up and jewellery, as well as items for occasional working. From Willow & Hall, the Ludwell blanket box features a comfortable upholstered top that doubles as a seat. In Laurel linen, it is priced £447. It’s all too easy to turn an under-the-stairs cupboard into a dumping ground for shoes, bags, coats, dog leads – and all those things that somehow don’t have another home. 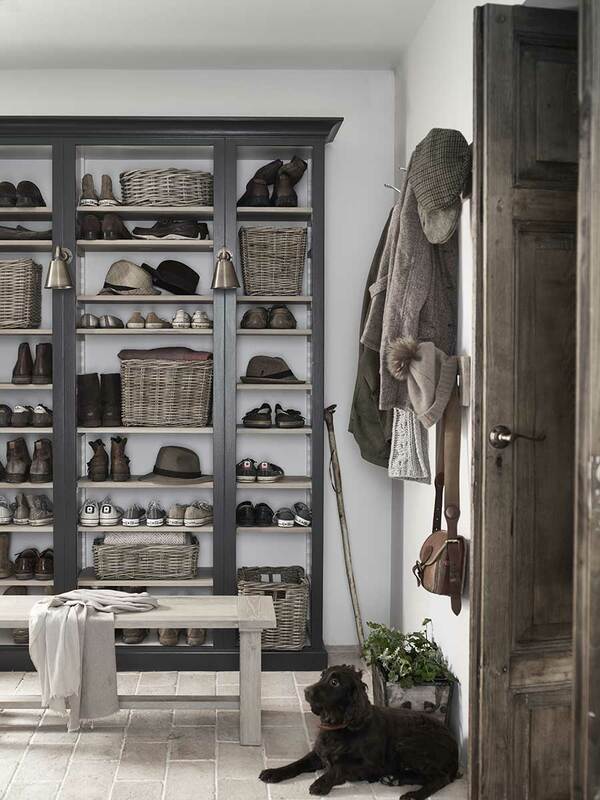 An organised area with racks for shoes or shelves to store the clutter will give everything a place and keep order. Also, don’t assume that a narrow hall can’t accommodate a coat rack or an area for shoes. Reduced-depth shelving can sit alongside the front door without impacting too much on the space; shelves just 30cm deep, for example, will hold a surprising amount. Keep the unit to a narrow width but run the shelving up to the ceiling and you will cut the hall clutter in no time. Pembroke fitted storage from Neptune is 337mm deep and 2170mm high and is available in a wide range of colours. Priced £840. Once upon a time every kitchen had a larder or a pantry to store food and, in particular, keep items cool away from the heat of the kitchen. The fridge has rendered the need for a cold slab redundant but the order of the pantry with its shelves and drawers is a helpful addition for a small kitchen. 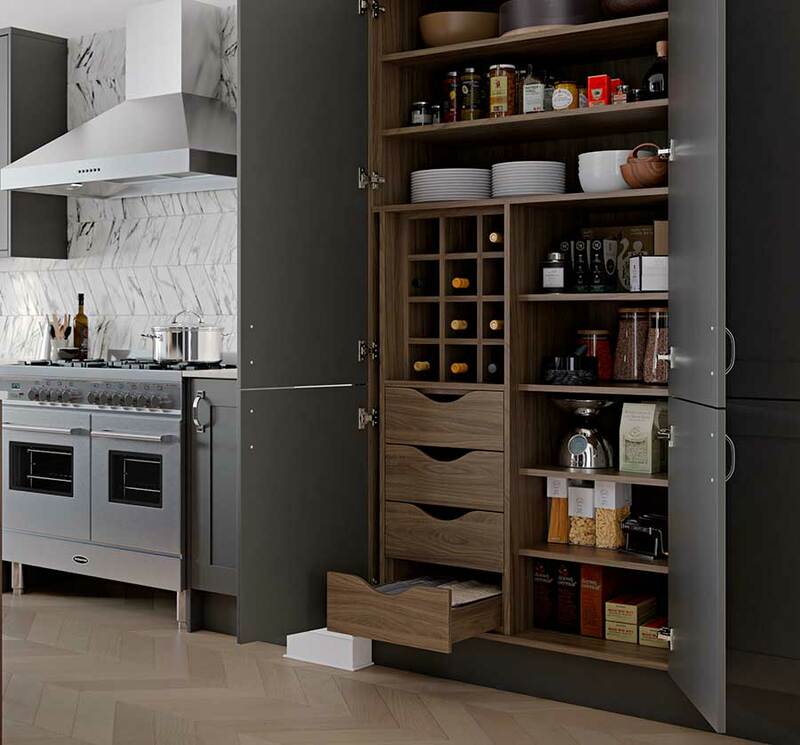 Choose a larder cupboard with some level of customisation and you will have an effective and efficient means of storing all the dried goods, bottles and tins you like to cook with. It will keep everything to hand, but you can then shut the doors for an instant tidy up. 10: The pantry system from Masterclass Kitchens is shown here in Tuscan walnut in a Chatsworth shaker-style kitchen. Prices for a complete kitchen start from £7500.